Goalies $160 – 10 ice times, 50-min. Goalies will have a 15 minute separate training with the goalie coaches at the start of each ice time before joining the whole group for the combination drills. Enrolment is limited to 8 skaters and 3 goalies per group. Geared towards the advanced player, this is an intense full 50-minute shooting and goaltending session. Each of the 3 groups uses 1/3 of the ice. 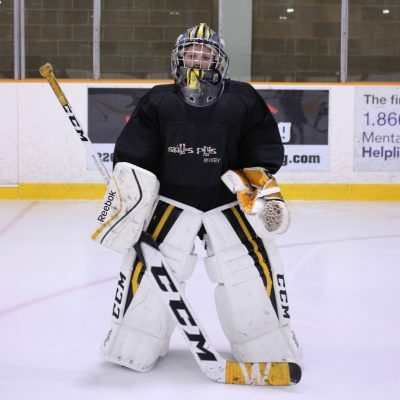 Goaltenders will be taught the modern butterfly technique and will work on their movement to position oneself square to the shooter. Goal scorers will focus on perfecting the various types of shots in a multitude of different scoring scenarios. The scoring drills will combined puck control and speed to maneuver in and out of traffic in the areas around the net to score.